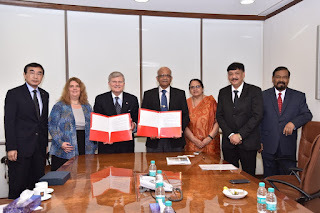 Mumbai, February 07: Manipal University, through the Manipal College of Dental Sciences (MCODS), signed a Memorandum of Understanding (MoU) here on Monday with Boston University, Henry M Goldman Schools of Dental Medicine (BUGSDM). The MoU seeks to promote mutual understanding and contribute to the advancement and progress of dental education and science through educational and academic collaboration, and exchanges of mutual interest and benefit. Manipal University has many such tie-ups with universities abroad that give many of its students an opportunity to go abroad as exchange students. The university has such tie-ups with many of the top institutions in Australia, Germany among others. While such exchange programmes give the students an exposure to the academic programmes there, they also open the eyes of the students to a whole new vista of opportunities and possibilities. The faculties also get to see the best of teaching methodologies and technologies in imparting education. The fields of medicine and engineering that need a continuous updation of the knowledge are the ones that benefit the most from such programmes. Boston University is no small operation. With over 33,000 undergraduate and graduate students from more than 130 countries, nearly 10,000 faculty and staff, 17 schools and colleges, and 250 fields of study, the two campuses are always humming, always in high gear.